Honourable Prime Minister Shahid Khaqan Abbasi inaugurated the first unit (660 MW) of 1320 MW Port Qasim Coal-Fired Power Project on Wednesday i.e. 29th November 2017. The Project is a part of China-Pakistan Economic Corridor (CPEC) while M/s POWERCHINA and AL-MIRQAB, Qatar are the sponsors of the Project. The inauguration ceremony was held at Karachi which was attended by Governor Sindh Mr. Mohammad Zubair, Chairman POWERCHINA Mr. Yan Zhiyong, Chairman AL-MIRQAB Capital, Qatar Prince Jassim, Minister for Power Division Sardar Awais Ahmad Khan Leghari, Minister for Maritime Affairs Mir Hasil Khan Bizanjo, Minister of State for Power Division Chaudhry Abid Sher Ali, Minister of State for Petroleum Division Mr. Jam Kamal Khan, Chinese Ambassador to Pakistan H.E. Mr. Yao Jing, Managing Director Private Power and Infrastructure Board (PPIB), Mr. Shah Jahan Mirza beside other senior officials from Pakistan and China as well as media personnel. While addressing the gathering, Honourable Prime Minister said that "today, Pakistan has not only met its energy needs, it has also surplus power". 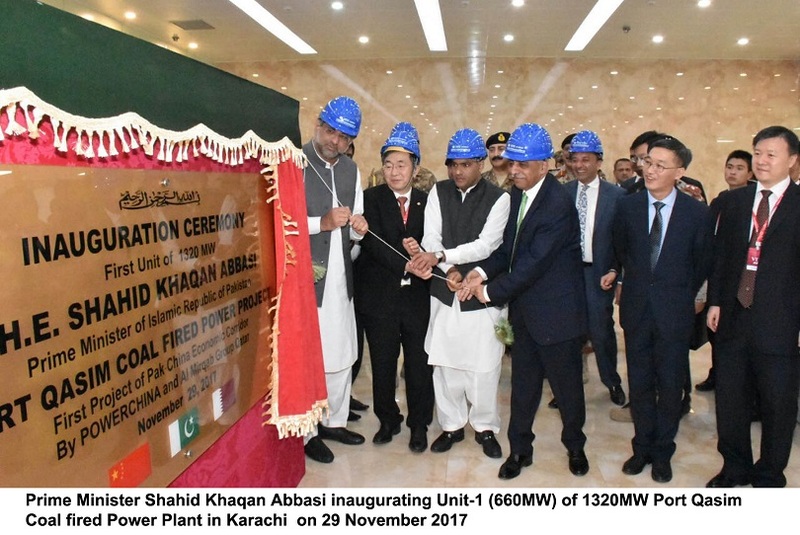 Congratulating POWERCHINA and AL-MIRQAB Capital, the premier said the completion of the first unit of coal-fired power project was a significant milestone in the CPEC, adding that the CPEC creating job opportunities for the youth, alongwith boosting economic prosperity. The 660 MW first unit of the Project has been completed in 30 months - ahead of schedule - and the second unit will also be completed ahead of the schedule in February 2018-around two months ahead schedule, he assured. The PM also mentioned various power projects, including coal-fired, gas-fired and hydel-based power plants, which had added thousands of MWs to the national grid over the last four years. The Premiere in his concluding words, appreciated the untiring efforts of the Power Division of Ministry of Energy, PPIB, NTDC, Government of Sindh and Port Qasim Authority for making this project a reality. Speaking on the occasion, Federal Minister for Power Division Sardar Awais Ahmad Khan Leghari said the Ministry would keep working to take on challenges like constraints in Distribution of Power, Overbilling, Line losses and Transparency. He said the Federal and Provincial governments would soon legislate for National Electricity Plan who would penalise companies for inefficiency in distribution and those involved in power theft would have to face imprisonment up to three years. Ensuring transparency and streamlining of billing system, he claimed that the Premier would inaugurate Net Metering System soon. The 1320 MW Port Qasim Project was issued Letter of Interest by PPIB on 21st May 2014, Letter of Support on 17th April 2015 while Financial Closing was achieved on 22nd December 2015. Ground breaking of the project was performed by the former Prime Minister Muhammad Nawaz Sharif on 6th May 2014. Due to the vigorous processing and follow up by the PPIB, first unit of the project has been completed in less than 23 months after achieving the financial close.